Hi folks! So after 6 weeks off from running (with a mix of spin and elliptical, but not rowing because that strained my Peroneal tendon), I’m back! Slowly and cautiously. I took my first test run on Saturday the 26th and it felt pretty good. Well, it was hot and sunny and I had to break for water on the 2.5 mile loop, but pretty good considering. I’ve done a couple of similarly short runs since and the pain after is basically nil. I’m trying to make better efforts toward stretching, recovery, and pre-running prep (glute activation) as well as doing more yoga. I’ll just catch everyone up on my recent eats. It’s softshell crab season! And ramps season! And frosé season! My birthday was June 2nd, so there were a lot of good eats. That’s it for now, folks! I’m still base building and trying to choose a training plan for NYC Marathon training. 9/11: Belated Long RunCommute. I mapped out the perfect 14 miles from work to home across the Queensboro Bridge, through the most southerly reaches of Central Park, down the Hudson River Greenway, and around the Battery to and across the Manhattan Bridge. 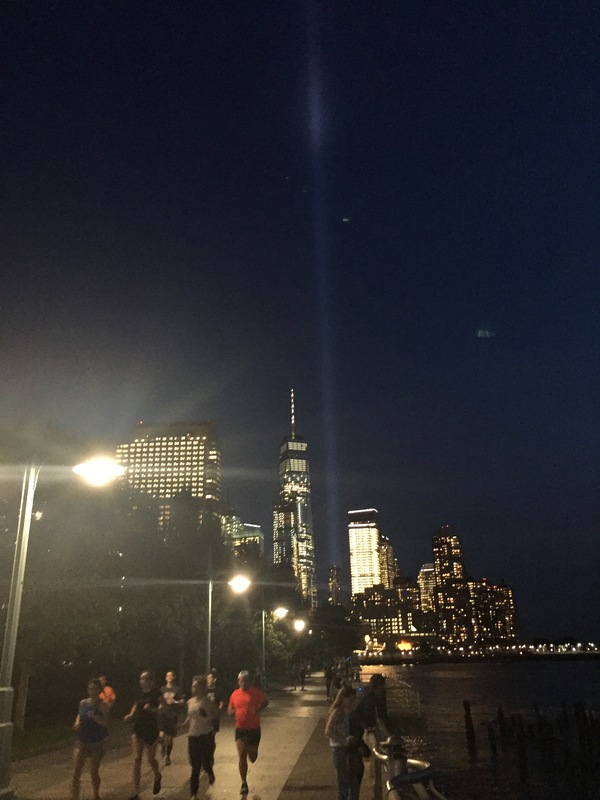 I had many beautiful views of the 9/11 Tribute in Lights on the way. 9/12: Morning yoga but rest day from running. Holy crap, my hip flexors have been taking a pounding. I was off balance and weak, but glad I got in there. 9/13: I felt like crap after work and was going to skip running altogether but decided to meet the Beer Running group at the bar they ended up at, then figured I may as well get some more miles in so ran past home with some people then back home solo. 3.82 miles total. 0.62 miles to the bar, 3.1something after 2 beers. 9/14: I was planning to get 3 miles in as a warmup on the gym treadmill before lifting and doing strength work with my friend Allison, but due to a subway mishap (sick passenger), I got there super late and only fit in 1 mile. I then had a Restorative Yoga class later in the evening at Area Yoga, which was amazing for my stiff hips. The instructor gave some modifications and adjustments that were much needed. 9/15: 4 AM miles to the park and back. Later on, rooftop drinks at Rooftop 93 in Chinatown. Then rooftop drinks and pizza at Porta in Jersey City. 9/16: Rest day but I went to 7 different art galleries in Chelsea. So many great exhibits, including Kara Walker at Sikkema Jenkins and Maya Lin at Pace Gallery. 9/17: 11 mile long run done in the late afternoon. I missed my chance in the morning but felt pretty good (maybe some of the humidity broke). I covered both Prospect Park loop and Brooklyn Bridge Park and hit a couple miles accidentally at goal marathon pace, which was a huge confidence booster. Total: 34.8 miles out of a prescribed 28 (cutback week), so again, we’re counting Monday’s 14.1 for last week and it was actually only 24 miles. I had to lie to the Virtual Trainer to save face and not throw off my stats. I undershot this week in part due to my aborted gym warmup Thursday and missing the extra few I had hoped to get Wednesday, but that’s ok.